Back Row (L to R): John Gorman, Stephen Slater, Alan Tobin, Shane O'Donovan, Stephen Enright, Jason Healy, Stephen Lanigan, Dane Tobin, Seán O'Hare, James O'Mahony, John O'Driscoll, Jamie Organ, Donal Henley. Front Row (L to R): Joe Power, Conor Moloney, Brendan Walsh, Willie John Kiely, David Power, Richie Ryan, Patrick Bergin, Ciarán Mitchell, Jamie Ryan, Billy Ryan, Johnny Burns. 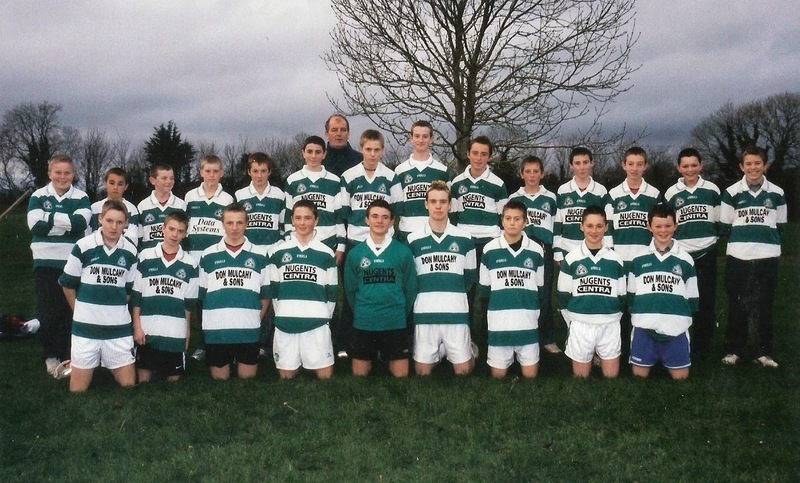 This week's photo shows the Ballinacourty team and mentors that won the Western and County U16 Football titles in 2004. Victory in this year meant a three in a row of divisional and county titles at this grade. Congratulations to our U21 panel and management team on their fantastic 1-12 to 0-13 victory over St. Oliver's in the Western U21 'A' Football Championship Final played at Fraher Field this evening. This win secured the club's 14th divisional title at this grade and first since 2013. We now play Rathgormack in the County Final. Just a quick reminder that there will be a clothing recycling drive in aid of Abbeyside / Ballinacourty Juvenile Club tomorrow, Saturday. Please drop off all items at the clubhouse between 10.00am and 3:30pm on March 28th. Please donate all your clean unwanted clothes also bed linen, towels, curtains, shoes, bags, belts and soft toys. Wearable clothes will be recycled and re-used and other items will be recycled for items, such as, industrial wipes or soundproofing. Laptops (must be intact with lead) also mobile phones are accepted but please keep separate. No household bric a brac. If you cannot make it to the clubhouse on the day, please contact Audrey (087-6987388) or email (clonea@me.com) before the 28th March to make arrangements for collection of items. Our minor football team played their latest round of the county minor championship on Sunday morning last away to Gaultier. After a poor start we settled into the game and came away with a hard earned victory. It was great to see so many of our young kids decked out in their club colours in the St. Patrick’s Day parade. Everyone involved seemed to enjoy themselves and a big thank you must go to all the adults who helped out on the day. On Saturday morning of last week our under 8 team took part in a blitz in Carriganore and everyone involved had a great day out. It is vital that everyone in the club has their membership paid before the end of the month. The membership is as always vital for insurance reasons. Parents co operation on this matter would be very much appreciated. Everyone in the club would like to congratulate all the kids in the parish who have made their Confirmation over the last few weeks. Our outdoor hurling sessions continue again on Saturday morning the 28th March at our club grounds. These sessions will include under 6, 7 and 8s and will run from 10.30 to 11.30. Our under 9 team will train between the time of 11.30 and 12.30 at our wall ball. All are welcome to attend and it would be great to see some new faces. Helmets will be available to buy at a discounted rate at these sessions. 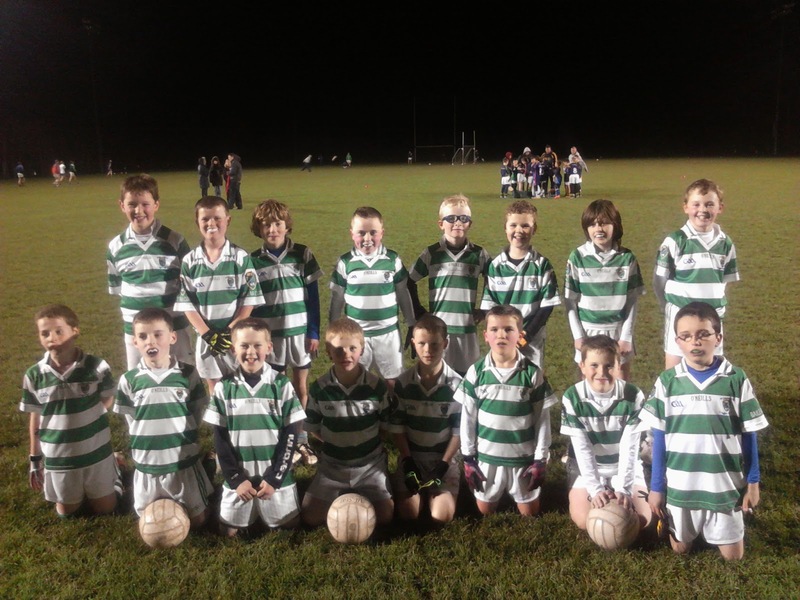 The U10's played their next game in the Western Football League on Friday night (20th March) at the club grounds. Tallow were the visitors to Abbeyside. Following good displays already, the boys backed it up with their best performance to date with scores coming from all over the pitch. The match was played under the lights and all the boys were delighted with the opportunity to play a game with the floodlights on. We were due to play the Nire on Monday night (23rd) in the Nire. Report next week. No training Friday night (27th) as we have a blitz in Carriganore on the Saturday. 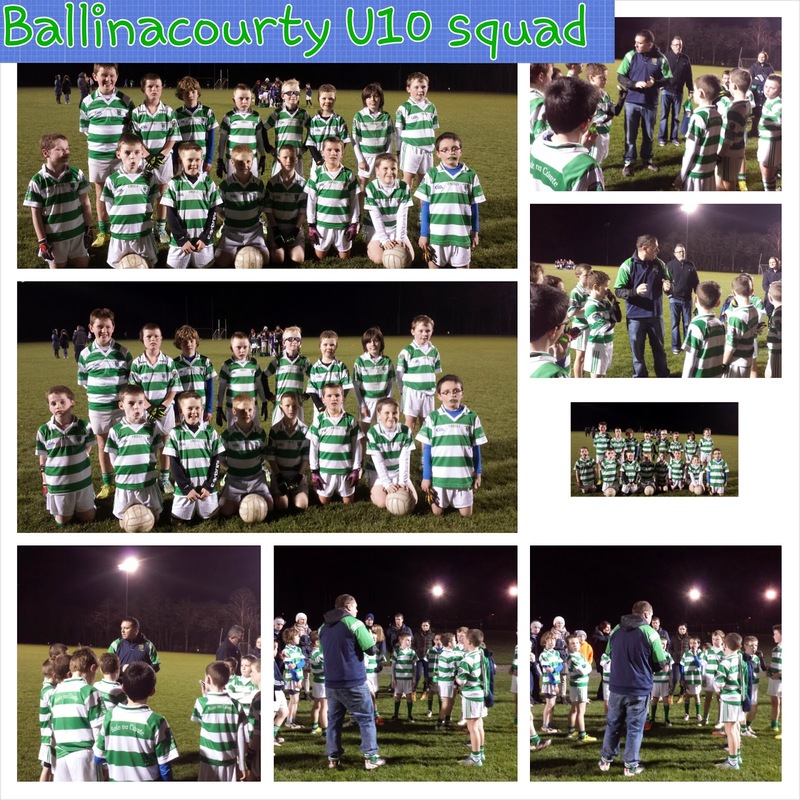 Back Row (L to R): Billy O'Connell, Kieran Cosgrave, Fionn Murchú, Jake Fitzgerald Drummy, Daniel Morrissey, Jack O'Donovan, Jamie Mulcahy, Darragh Walsh. Front Row (L to R): Sam Phelan, Cormac Dunne Fitzgerald, Jake O'Donnell, Brian Callaghan, Darragh Cosgrave, Seán Queally, Seán Walsh, Conor Gough. There will be a clothing recycling drive in aid of Abbeyside / Ballinacourty Juvenile Club next Saturday. Please drop off all items at the clubhouse between 10.00am and 3:30pm on March 28th. Please donate all your clean unwanted clothes also bed linen, towels, curtains, shoes, bags, belts and soft toys. Wearable clothes will be recycled and re-used and other items will be recycled for items, such as, industrial wipes or soundproofing. Laptops (must be intact with lead) also mobile phones are accepted but please keep separate. No household bric a brac. If you cannot make it to the clubhouse on the day, please contact Audrey (087-6987388) or email (clonea@me.com) before the 28th March to make arrangements for collection of items. Cadhla McGrath will be presented with her All Ireland U16 medal for 2014 at a banquet at the Park Hotel on this Saturday night. Congratulations to Cadhla from all at Abbeyside Camogie Club. Camogie starts for the U10’s and U8’s at Abbeyside G.A.A pitch on this Friday from 5.00 to 6.00. Registration forms will be given out at this training. 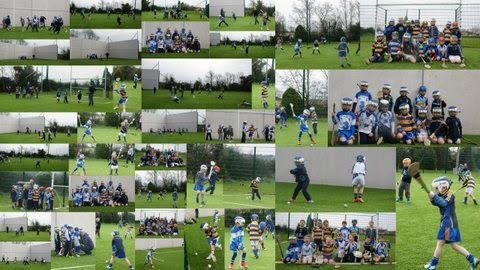 Below are pictures of our U12 hurlers who took on Ballygunner in Abbeyside recently. L to R: Mark Gorman, Kevin Tobin, Bernard Gorman, John Gorman & Jim O'Mahony. 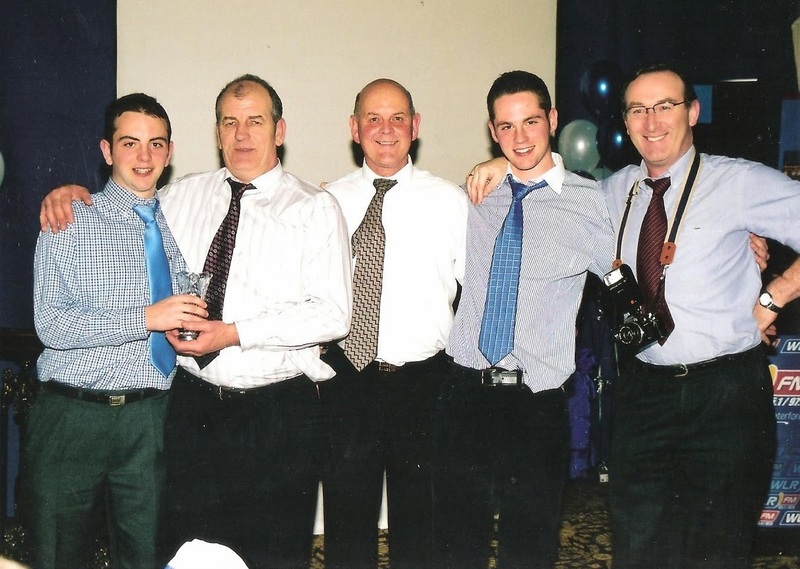 This week's photo comes from 2004 and shows Mark Gorman with family and supporters at the Granville Hotel / WLR FM GAA Awards in April of that year. Mark's performances on the field earned him this prestigious award and saw him join a select group of Abbeyside / Ballinacourty personalities to win the accolade. Our ever popular Jack the Joker fundraiser continues this Sunday night in Alice O’Connor’s Bar where the jackpot is €5,400. On Sunday night last Elaine Mulcahy was drawn out and chose card number 35 which wasn’t the Joker although he did win €50. Pat Walsh and Nora Tobin won €25 each. As well as our group of ticket sellers tickets can be purchased from Convenience Store Ballinroad, Village Flowers, Spar, Mousies Takeaway, Minnies Bar and Crottys Corner Bar. Our under 21 footballers defeated Dungarvan in the Western Championship on Friday night last in Fraher Field which qualified them for the Western Semi Final against Comeragh Gaels. This game took place on St. Patrick’s Day and we will have a report on it for next week’s notes. TEAM: K. DWANE, J. DUGGAN, B. LOOBY, S. O’GORMAN, C. McCARTHY, E. BERGIN, C. McCARTHY, C. PRUNTY, J. ELSTED, D. LOOBY, M. MAHER, D. SWEENEY, M. COLEMAN, S. CLIFFE, L. POWER. SUBS: N. MONTGOMERY, C. DWYER, R. CONWAY, E. KIELY, S. O’CONNOR. On Saturday our Senior Footballers played De La Salle in the County League in De La Salle where they recorded a 3 point win. This Friday night they play The Nire in Abbeyside at 8:30pm. Tickets for the 2015 Deise Development Draw are currently on sale throughout the parish and we once again appeal to all our loyal supporters to please come on board and support the draw as not only do you have the opportunity to win some wonderful prizes but the draw is also a source of vital income for the club. Tickets can be obtained from any Committee member and we will be calling to the houses of the parish over the next number of weeks promoting the draw. We would ask all players to please make an effort to get their membership fees paid as soon as possible as any player who suffers an injury in training or matches is not covered by insurance unless they have paid their membership . Membership can be paid to Kevin Tobin or Pa Enright. Our Club Bingo will continue this Sunday night in the CBS Hall where the jackpot is €1,150. 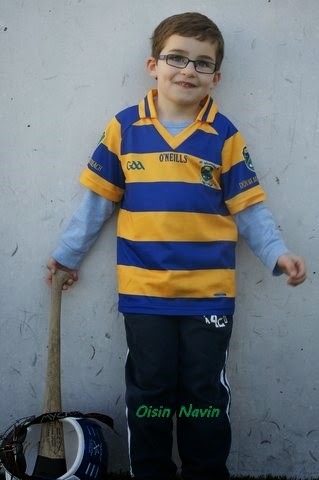 Our outdoor hurling sessions continue again on Saturday morning the 21st March at our club grounds. These sessions will include under 6, 7 and 8s and will run from 10.30 to 11.30. Our under 9 team will train between the time of 11.30 and 12.30 at our wall ball. All are welcome to attend and it would be great to see some new faces. Helmets will be available to buy at a discounted rate at these sessions. There will be a clothing recycling drive in aid of Abbeyside / Ballinacourty Juvenile Club for the next two Saturdays. Please drop off all items at the clubhouse between 10.00am to 12.30pm on March 21st. They can be dropped at the clubhouse between 10.00am and 3:30pm on March 28th. Please donate all your clean unwanted clothes also bed linen, towels, curtains, shoes, bags, belts and soft toys. Wearable clothes will be recycled and re-used and other items will be recycled for items, such as, industrial wipes or soundproofing. Laptops (must be intact with lead) also mobile phones are accepted but please keep separate. No household bric a brac. If you cannot make it to the clubhouse on the day, please contact Audrey (087-6987388) or email (clonea@me.com) before the 28th March to make arrangements for collection of items. We kicked off the season for the under14 football team on Sunday morning the 8th March with a good display against Ring. We played some good open football and ended up deserving winners. Our next game in this competition is against Clashmore. We all wish DJ Kiely a speedy recovery as he broke his wrist during this game. Meanwhile our under13 football side played their first game of the championship over the weekend going down in a close match to a stronger Nire team. Our under16 football team played their second game of the county championship on Sunday morning last against St. Pat’s. On the day our team never really got going and lost out to a stronger more determined St. Pat’s side on the day. This Sunday morning we play Gaultier in Gaultier at 11am in the County Championship. Back Row (L to R): Richie Foley, Diarmuid O'Hare, Seán O'Hare, Keith Collins, Dane Tobin, Jason O'Brien, David Hickey, Donncha Enright, John Gorman. Front Row (L to R): Stephen Lanigan, Mark Ferncombe, James O'Mahony, Brendan Walsh, Craig O'Connor, Stephen Slater, John O'Driscoll, Stephen Enright, Willie John Kiely, Alan Tobin. 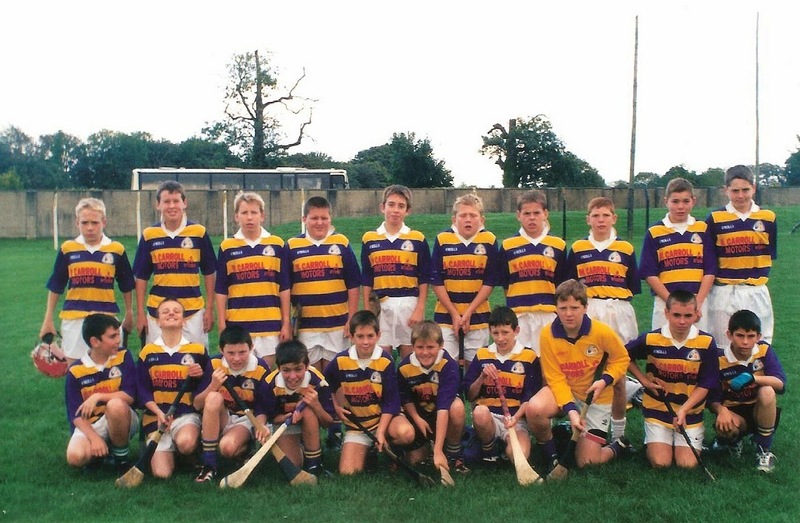 This week's photo brings us back to the year 2000 and shows young Abbeyside hurlers in Cappoquin. Many of these players won numerous Western and County Hurling Titles in the years that followed and indeed some are very much still part and parcel of the club's senior team today. Our ever popular Jack the Joker fundraiser continues this Sunday night in Alice O’Connor’s Bar where the jackpot is €5,200. On Sunday night last Jim Egan was drawn out and chose card number 27 which wasn’t the Joker although he did win €50. Jack O’Hare and Paula Dunford won €25 each. As well as our group of ticket sellers tickets can be purchased from Convenience Store Ballinroad, Village Flowers, Spar, Mousies Takeaway, Minnies Bar and Crottys Corner Bar. Our under 21 footballers take on Dungarvan in the Western Championship this Friday night in Fraher Field at 7:30 pm. This Saturday our Senior Footballers play De La Salle in the County League at 12pm in De La Salle. Our Club Bingo will continue this Sunday night in the CBS Hall where the jackpot is €1,100. Abbeyside / Ballinacourty GAA Club has adopted the GAA Mental Health Charter. Click here to learn more about this new initiative. Back Row (L to R): Philip Cashin, Mark O'Connor, Conor Hickey, Conor O'Dwyer, Diarmuid Henley, Conor Moloney, Tom Hanrahan, Stephen Kearney, Michael O'Halloran, Kevin Dee, David Morrissey, Colm Kindregan, Ronan Sheehan. Front Row (L to R): Pierce Galvin, Cathal Reynolds, Jonathan Sheehan, Kevin Duhig, Aaron Joyce, Craig Kinghorn, Damien Doyle, John Power, Ross Dunford. 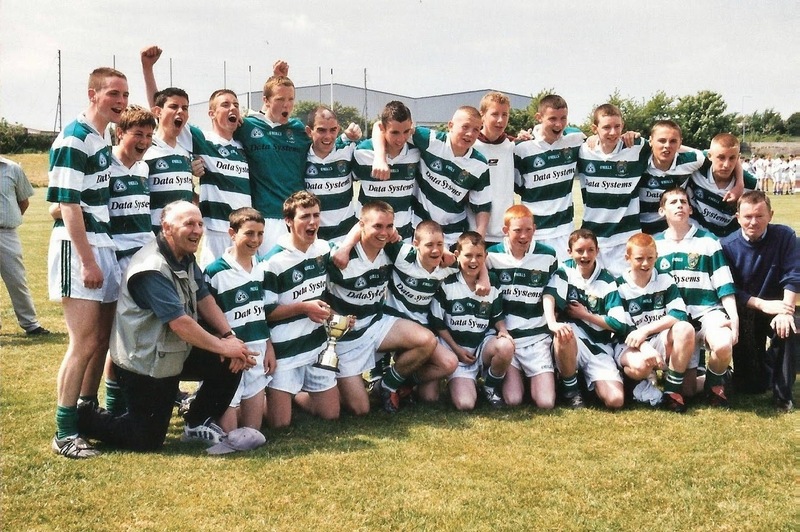 This week's photo comes from 2004 and shows Kevin Tobin and his young Ballinacourty football team. Many of these players went on to win Western and County titles throughout the subsequent decade. Indeed some are now key members of our senior team. Our ever popular Jack the Joker fundraiser continues this Sunday night in Alice O’Connor’s Bar where the jackpot is €5,000. On Sunday night last Marie and Shirley were drawn out and chose card number 6 which wasn’t the Joker although they did win €50. James, Jack and Joey and the Cosgrave family won €25 each. As well as our group of ticket sellers tickets can be purchased from Convenience Store Ballinroad, Village Flowers, Spar, Mousies Takeaway, Minnies Bar and Crottys Corner Bar. Our under 21 footballers got back to winning ways on Friday night last when they defeated Clashmore in Abbeyside in the losers group of the Championship. We now advance to meet Dungarvan in the next round which will possibly take place on Friday, March 13th. TEAM: K. DWANE, C. McCARTHY, B. LOOBY, S. O’GORMAN, C. McCARTHY, E. BERGIN, J. DUGGAN, C. PRUNTY, J. ELSTEAD, D. SWEENEY, D. LOOBY, M. MAHER, L. POWER, S. CLIFFE, M. COLEMAN. SUBS: C. DWYER, N. MONTGOMERY, R. CONWAY, E. KIELY, S. O’CONNOR. This Saturday our Senior Footballers play their first game of the year as they take on Gaultier in the Phelan Cup in Abbeyside at 3pm. Also the club are continuing on with our Development Fund, The Club 300 Initiative. This was a wonderful success for the last 5 years and we hope that it will get the same great support this year. The money raised over the last 5 years enabled us to carry out all the development work that has taken place in the field and we hope to be in a position to carry on with further development work in the not too distant future. In order to do this we require the support of the community and we appeal to all those of you who are position to join the 300 Club to do so and help us to provide the very best facilities for our Juvenile and Adult Players in the years to come. Our Club Bingo will continue this Sunday night in the CBS Hall where the jackpot is €1,050. We played our first under 16 football championship match against our neighbours Dungarvan in Abbeyside last Sunday morning. Our boys finished stronger to record a 2-7 to 0-5 win. Next match in this grade is Naomh Brid on Sunday 15th March. Our under 14's are away next Sunday 8th to An Ghaeltacht. Our outdoor hurling sessions continue again on Saturday morning the 7th March at our club grounds. These sessions will include under 6, 7 and 8s and will run from 10.30 to 11.30. Our under 9 team will train between the time of 11.30 and 12.30 at our wall ball. All are welcome to attend and it would be great to see some new faces. Helmets will be available to buy at a discounted rate at these sessions. Our minor football team play their next championship game this Sunday morning at home to De La Salle at 11.30. We wish everyone involved well. There will be a clothing recycling drive in aid of Abbeyside/Ballinacourty Juvenile Club on Saturday, 28th March. Please drop off all items at the clubhouse between 10am to 3.30pm. Please donate all your clean unwanted clothes also bed linen, towels, curtains, shoes, bags, belts and soft toys. Wearable clothes will be recycled and re-used and other items will be recycled for items, such as, industrial wipes or soundproofing. Laptops (must be intact with lead) also mobile phones are accepted but please keep separate. No household bric a brac. If you cannot make it to the clubhouse on the day, please contact Audrey (087-6987388) or email (clonea@me.com) before the 28th March to make arrangements for collection of items.